**Limited colors and sizes still available. Email tile@restorationtile.com for inquiries. 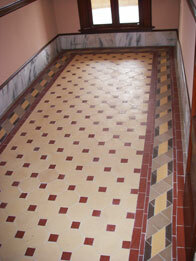 Recreating the Grandeur of the American Restoration Encaustic Tile company. Porcelain Geometric tiles (geometric, compatible shapes) have been used for centuries to achieve highly decorative and highly functional designs. This English architectural heritage has been used extensively in the United States for public buildings, commercial establishments, and exclusive residential applications. American Restoration Encaustic Tile supplies these tiles to bring the Victorian era to life in unlimited combinations of size, pattern and color.